Did Luther Regret the Reformation? 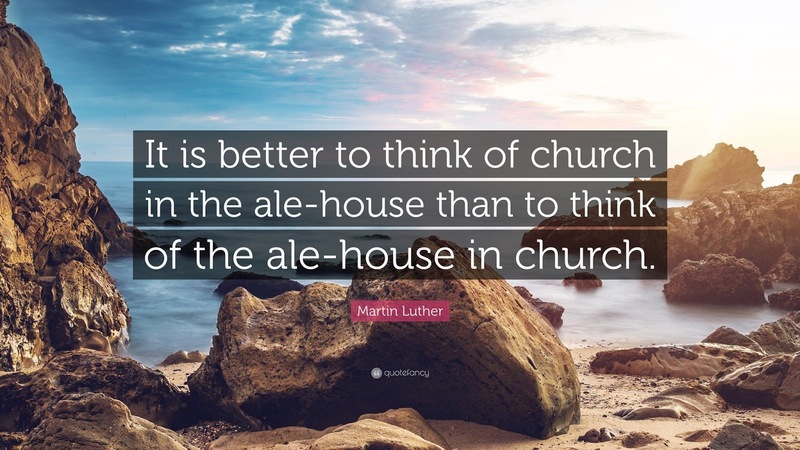 As a beer loving German Lutheran, my favorite quotation by Martin Luther is the following: "It is better to think about church in the ale-house than to think about the ale-house in church." "It is better to think of church in the ale-house than to think of the ale-house in church." "Tis' better to think of church in the alehouse than to think of the alehouse in church." "Better to think of church in the ale-house than to think of the ale-house in church." 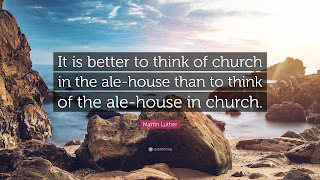 Luther said, “It is better to think of church in the ale-house than to think of the ale-house in church.” What I take from this quote is that God longs to be included in every part of our existence – not just the hour we spend on Sunday mornings in Church. Beer and hymns is a great opportunity to invite God into the routine activities of something as simple as eating and drinking. I found no documentation. All the online usages I came across appear to be recent, post-2000. This service which God hath enjoined upon us, is not laborious, but easy. It requireth nothing but our time and attention: and if it can afford a person pleasure to sit during whole days and evenings at an ale-house or tavern, engaged in revelry and mirth with lewd and wicked companions, it should give him little pain to sit, during a few hours, in the house of God ; for he would not only spend his time more profitably to himself, but would also render an acceptable service to his Maker. If this duty seem burthensome, how should we endure to go from temple to temple, and from altar to altar, to attend to rites and ceremonies, as we did among the papists? Or how should we sustain those laborious services, such as carrying stones from quarries, and going armed on pilgrimages, which those blind bigots imposed upon us! These services were performed willingly, when we were deluded by false doctrine (source). Eating and drinking are not forbidden, but rather all food is a matter of freedom, even a modest drink for one’s pleasure. If you do not wish to conduct yourself this way, if you are going to go beyond this and be a born pig and guzzle beer and wine, then, if this cannot be stopped by the rulers, you must know that you cannot be saved. For God will not admit such piggish drinkers into the kingdom of heaven [cf. Gal. 5:19–21] (LW 51:293). The historical record nowhere documents Luther ever being drunk. It does provide evidence that he did drink alcohol and that he enjoyed drinking. One needs only survey the massive output of work that Luther physically did (preaching, teaching, etc.) and produced to settle the matter that Luther did not have a drinking problem. Luther preached and wrote against drunkenness throughout his entire life with vigor and force. As biographer Heinrich Boehmer notes, “Luther attacked the craving for drink with word and pen more vigorously than any German of his time. He told even princes his opinion of it, in private and public, blamed the elector himself publicly for this vice, and read the elector’s courtiers an astonishingly drastic lecture” [Heinrich Boehmer,Luther and the Reformation in the Light of Modern Research (London: G. Bell and Sons LTD, 1930), 198]. "Is there any bran?" Our Epicureans are also like that. We place the finest fare of our salvation before them in church, the forgiveness of sins and the grace of God. Then they turn up the nose and grub (scharren) for dollars, saying: Is there any bran? Well, garbage is to be put into a sow. Thus it happened to Ambrosius. He was once told by his parishioners, after they had been admonished to hear the Word and the sermon: The truth is, dear pastor, that if you were to tap a keg of beer in church and call us to enjoy it, we would be glad to come. (W-T 3, No. 3663) [English translation: Ewald Plass, What Luther Says, Vol. 1, p. 303]. Looking for an Obscure Luther Quote? Chances are if you've wound up on this site, you're looking for information on an obscure quote said to come from Martin Luther or one of the other Protestant Reformers. This blog has been compiling information on obscure Reformation quotes for over a decade. Use the search engines below to look for your particular obscure quote. Luther Added The Word "Alone" To Romans 3:28? Did Luther Say: Be A Sinner And Sin Boldly? Reviewing a Romanist's Use of Roland Bainton's "Here I Stand"
The Ecumenical Luther and Roman Apologists: Who is a Christian? Select Works of Martin Luther: an Offering to the Church of God in "the Last Days"
This is the best book available on Sola Scriptura. For Protestants, it will help you understand and defend sola scriptura. 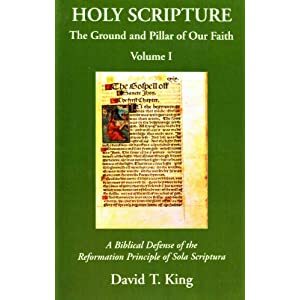 For Catholics, this book will help you understand exactly what Protestants mean by sola scriptura, rather than what you think it means. I highly recommend getting this book, it never leaves my desk, and serves as a valuable reference tool.